What is it with Weeds? SOURCING MATERIALS OUTSIDE THE US? The supply chain has evolved into a critical component of a company’s ability to satisfy customers, drive profitable growth and deliver new innovations to the market. In addition to the standard sources of risk – hurricanes, transportation and labor disputes, world events have created new sources of risk that were unforeseeable a few short years ago. The supply chain has the potential to be a significant profit center with a direct impact on a company’s ability to launch new products, deliver exceptional service and reduce working capital across the network. Earthcrew offers, through our strategic sourcing, a collaborative approach globally with select suppliers. Our global sourcing agent is conversant in multiple languages and makes site inspections so we can offer effective material coordination and QC of materials sourced. We help companies grow their business, launch new products and radically transform their operations all while reducing inventory, decreasing risk and increasing service to their customers. We can customize your bulk order to your needs and specification. Solutions, sourcing and new materials: Helping you make the leap. Adding Biochar and Mycorrhizae to soil augments its sustainability and long term Carbon sequestration. 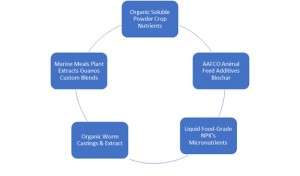 Combining these two inputs as soil remediation, compounds their cumulative beneficial properties.